Elegance, class, and refinement – these are qualities that inspire you. They are the qualities seen so often in the Golden Years of Hollywood. Women like Bette Davis and Katherine Hepburn were our style icons; strong women that could take on any man in an argument, all while never giving away their femininity. They’re your hero’s and you model your style after them. 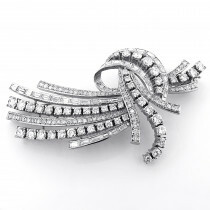 Your jewelry definitely tells the world that you embrace vintage style and sophistication. If you’ve been searching for amazing vintage estate jewelry such as antique diamond brooches, you’ve come to the right place. Our selection will make you feel like you’re attending an estate sale of one of the great, old-time actresses. 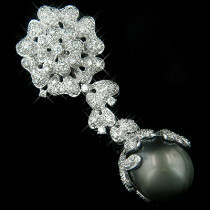 All of our pieces are intricately designed and unique. 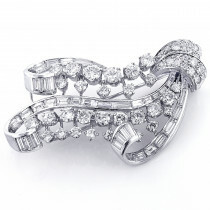 The antique diamond brooches shimmer and shine just like the bright lights of Hollywood. 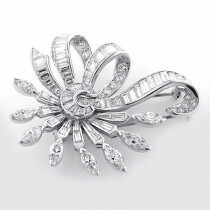 Imagine opening a lovely box containing your new vintage brooch. See the glimmer of light reflecting off of the stunning diamonds as you rotate the box to try and catch all of the light. What an experience! These brooches make fabulous gifts – for yourself or someone else who has the same sensibilities and taste as you. Take a look at our beautiful selection today.